First of all, you must have a Facebook Business Manager account. If you don't, click here to create one. 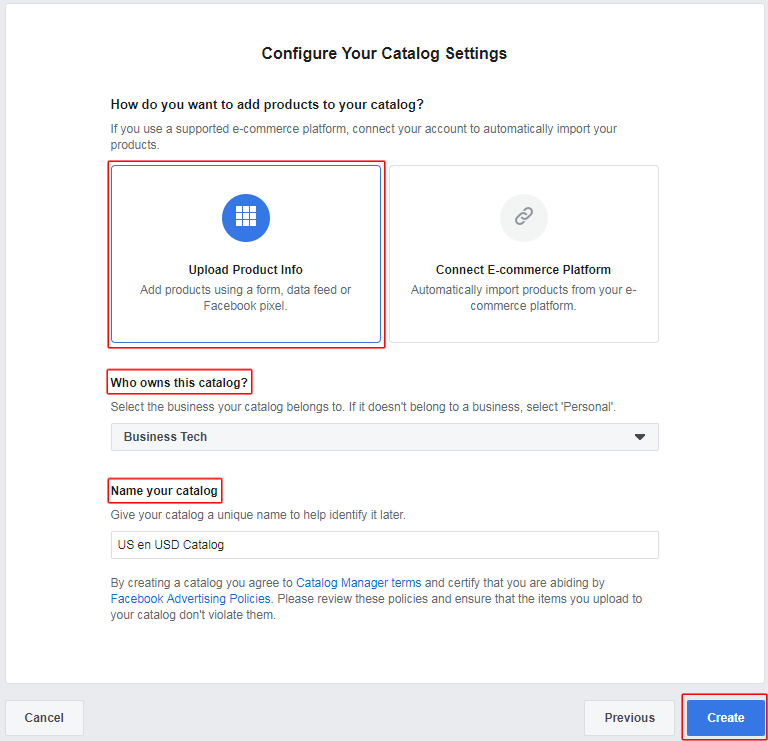 In the Facebook Business Manager, you can either use the catalog created by default by Facebook (to know more, click here), or use your own catalogs. The advantage of creating your own catalogs is that you will be able to set ads in different languages, different currencies and for different countries. Indeed, you will be able to associate a "Country/Language/Currency" feed to each manually created catalog and then use a different catalog according to the targeted language for example. 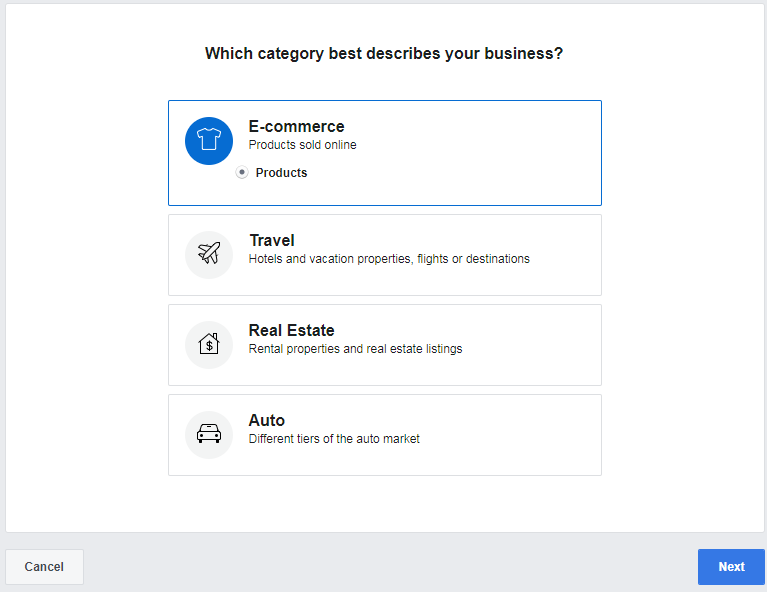 Choose the "Upload Product Info" solution for adding products in your catalog because you're going to add products through a data feed generated by your "Dynamic Ads + Pixel" module. Finally, give a name to your product catalog. If you generate several feeds through the module, you will have to create a catalog for each feed, that is to say, for each "Country/Language/Currency" group installed on your shop. So we advise you to indicate these parameters in the name you give to this first catalog. For example here, for a campaign diffusion through the USA, in english and for the USD currency, we can write: "US en USD Catalog". Your catalog is now created. 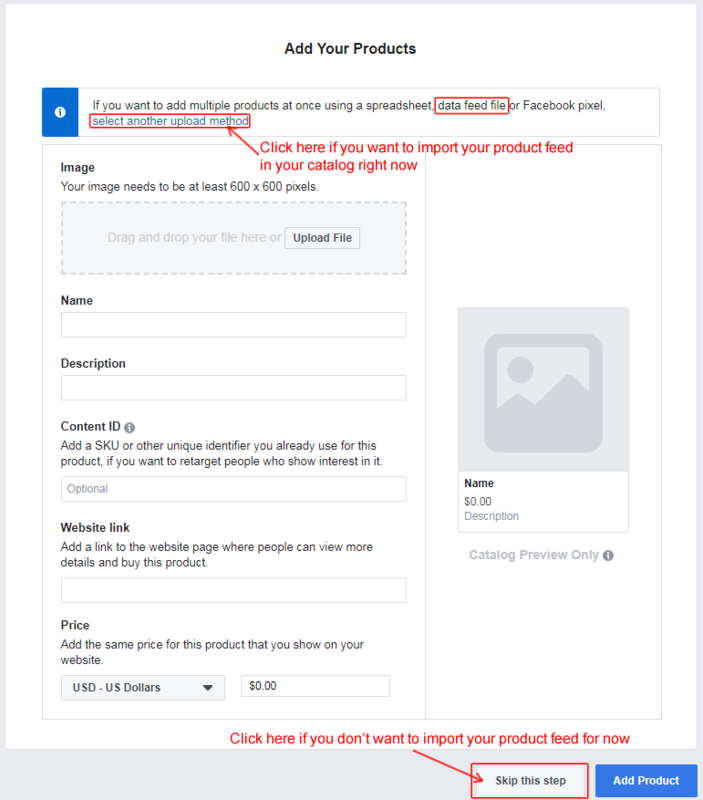 Facebook will ask you whether you want to add products to your catalog right now. If you want to import your product feed in the catalog now, click "select another upload method" from the message displayed at the top (to know how to import your feed, click here). If you don't want to add products for now, click "Skip this step". The main part of the window is for manually adding product, which, at first glance, does not concern you since you benefit from the possibility of importing all your products at once thanks to our module.